Bregenz situated at Lake Constance in the westernmost district of Austria, in Vorarlberg, is perfectly located. 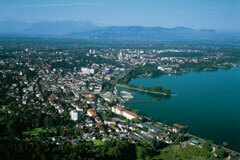 Not far from Innsbruck, Munich, Stuttgart, Milano and Zurich, Bregenz is the ideal meeting point. If hiking, swimming or culture, Bregenz has it all. The location at the lake, which is almost Mediterranean, invites all kinds of water sports: cycle along the shore of Lake Constance or walk to the top of the local mountain of Bregenz, the "Pfaender". Try your luck at the elegant Casino and play a round of Black Jack or Poker. The most important event in summer, for which thousands of visitors come to Bregenz every year, are the "Bregenzer Festspiele" (Bregenz Festival). The world's biggest floating stage with its unique opera productions and symphony concerts are unforgettable memories of your vacation in Bregenz. The new art museum of Bregenz was opened in 1997 and is itself a piece of art. The architect Peter Zumthor describes it in his own words: "From the outside, the building looks like a lamp. It absorbs the changing light of the sky, the haze of the lake, it reflects light and color and gives an intimation of its inner life according to the angle of vision, the daylight and the weather." Various exhibitions draw 60'000 visitors every year. This 1064 m/3491 ft. mountain at the foot of Bregenz can be reached either on foot or by a modern panoramic railway. Enjoy the view of the Swiss mountains, the Lake Constance and see the Allgäu and the Bregenzerwald. Take a stroll through the upper and lower town. Remains from the 13th and 16th centuries can be admired. Examples like the "Martinsturm", the landmark of Bregenz which was built in 1362 or the Gothic Parish Church of St. Gall of 1380 are worth a visit. Nowhere else in Austria does the jackpot get cracked as often as in Bregenz. The elegant building situated directly at the lake attracts vacationers to try their luck. Black Jack, Poker, Wheel of Fortune or roulette can be played in a peaceful atmosphere. Good luck! e like to drive through the valley under warm blankets and enjoy the winter wonderland. Book a horse drawn sledge, sit back and relax. Why not board one of the big boats on Lake Constance and take a trip to Konstanz (Germany) or visit the Island of Mainau, the flower paradise. There are various evening or day trips available. Located in the district Vorarlberg, Bregenz is approx 185 km/115 miles from Innsbruck and Munich and 122 km/76 miles from Zurich, which is also the closest airport. There is a train station in Bregenz where international and national trains stop.